Whilst domestic properties have been a little slow on the uptake of infrared heating technology it has long been a standard method of heating large spaces particularly factories and warehouses where there is often a need to move away from standard convection technologies. Despite this, it is certainly becoming more widely used and is now a popular way of heating smaller commercial premises, such as shops and offices, because of the aesthetic appeal of the panels and the reduced running costs compared to some other heating systems. For commercial premises infrared heating provides a quick and easy to install solution for keeping business spaces warm. Reduced costs compared to other, fossil fuel systems helps commercial concerns operate in a more efficient and carbon friendly way. When linked with technology such as solar panels it can help to reduce costs further. For businesses like shops or offices, infrared heating panels blend well with the décor and can be found in a range of different designs including glass, mirror and printed pictures. Quicker heating because infrared warms up solid objects rather than the air means you don’t have to wait for a room or office to heat up as you do with convection systems. As with homes, for small businesses and commercial premises the ideal solution for infrared heating comes through panels. These are lightweight and easy to install and can be used in a variety of circumstances to suit almost every need. For small offices a single wall or ceiling mounted panel may suffice, but for larger areas such as a meeting or sports hall you will find that a number of panels will need to be incorporated and strategically placed. For industrial complexes such as factories and warehouses, the use of infrared heating has been around for a long while now because of its potential to reduce costs and provide coverage over large open areas. 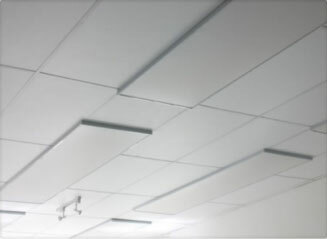 A range of ceiling and wall mounted ceramic heaters are used here to combine for wide spaces and can be easily installed and moved if necessary. The cost for small commercial premises is comparable to that of domestic homes. Infrared heating panels vary in price from the cheapest at $100 to larger, design friendly options that can be around $600 and can include mirror and picture panels. On top of that, for commercial premises there is the question of the number of panels that need to be installed to provide a full heating effect. Most businesses will consult with an installer or supplier who can advise on things like the positioning and size of panels needed as well as the potential cost savings. For industrials sites, the cost will obviously depend on the size of the property and the amount of space that needs to be heated, as well as the other renewable and carbon friendly technologies that are being utilised. More so than for domestic premises, commercial concerns will probably benefit from letting a trained installer take a look at their property with a view to finding the most cost effective and efficient system to put in place. This will include the cost benefits of changing from your existing heating system and the potential savings over the life of the installation. You can search for the best installers of infrared heating technology in your area by putting your details into our comprehensive database.